The Plug & Play wearable injector is designed to make treatment with biologic drugs safer and faster. Its single-step, plug-in mechanism works with all drug containers and helps patients take control of their treatment. Existing drug delivery devices require multiple user steps, which can make patients anxious and prone to mistake or needle stick injuries. The Plug & Play concept has colour-coded feedback (visible through the vial) and a clear view of the drug, which helps patients keep track of how the injection is progressing. Its flexible design converts any standard-sized vial into a ready-to-use drug container – allowing a range of biological drug volumes to be injected. 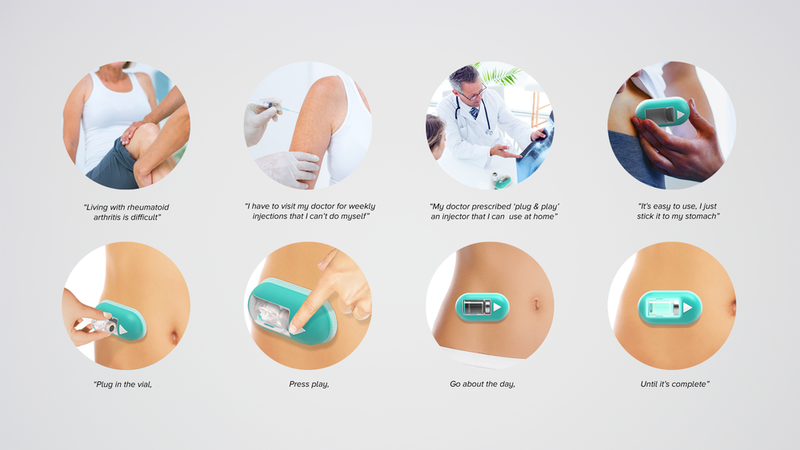 Once the vial is inserted into the wearable injector, the patient simply presses the play button and the injection begins.